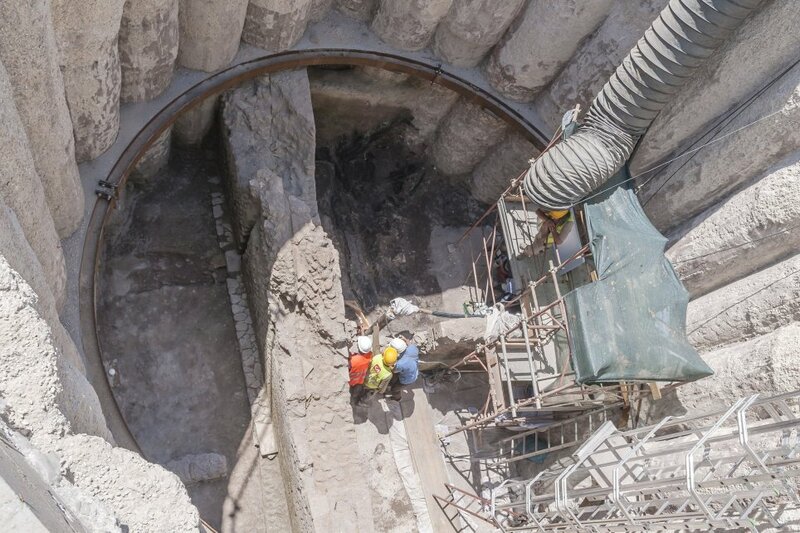 Rescue excavations in the framework of the metro extension works in Rome bring to light finds from ancient Rome. The latest discovery: Two Pompeian buildings near the Aurelian Wall, not far from metro station Amba Aradam in the capital. During reinforcement works on the Aurelian Walls near the new metro Line C, archaeologists discovered an ancient solarium, in an excellent preservation state. Archeologists have descended to 10 metres below ground level to assess the impact of the metro line works on ancient Roman monuments. Experts said the structure might have been part of the aristocratic homes on the Caelian Hill, near where it was found, one of the Seven Hills of Rome. Experts said that the newly discovered structure has Pompeian qualities, meaning that the solarium and the adjacent structures were preserved thanks to a fire on the site during the 3rd c. AD. Last year archaeologists found army barracks in Via Ipponio, also during the construction of Line C. Though archaeological discoveries are not rare in Rome, sites where wood is preserved are “extremely rare given the age of the site,” according to a press release by the Italian Ministry of Culture. A good preservation state only occurs in the case of exceptional climatic conditions, on sites such as Ercolano and Pompeii (a city preserved in volcanic ash). As the solarium recently found has wooden parts, this is considered a unique discovery for Rome, because wood is only preserved over such a long period in exceptional circumstances, albeit carbonized. Furthermore, archaeologists revealed frescoes and plaster fragments, pieces of furniture, sculptures and windows at the site. On the doorstep of a house, the carbonized skeleton of a dog was found. Experts from Italy’s National Institute of Geophysics and Vulcanology are going to investigate whether the fire was caused by seismic activity.